Nice. We need more and more of this type of infill. 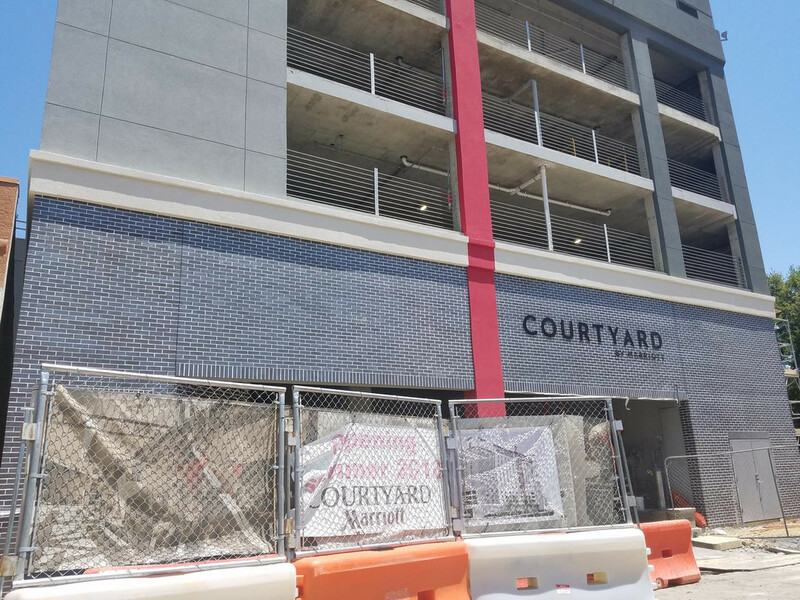 If Cindy's Deli can survive the construction, she'll be in an enviable spot wedged between two business hotels and across from the Courthouse. Should be good business all day long. Really like the little improvements happening in this area between these and 400 Record. I don't recall seeing anything, but has there been a new tenant for the soon-to-be-former DMN headquarters? So what is this next to Cindi's, the parking garage entrance? That end of downtown is a great place for small infill projects like this. Apartments, hotels, etc. Several small surface lots around there would be ideal for infill. Greyhound and McDonald's are the biggest perpetuators of crime in the area. That McDonald's location would make a great residential high rise site but I know it's not going anywhere. Construction site has a slightly updated rendering. This version seems to have less glass and none of the little portholes from the last version. Tnexster wrote: That McDonald's location would make a great residential high rise site but I know it's not going anywhere. The NE corner of the Greyhound bus terminal would make for an interesting flagship McDonald's. Not the most exciting project in the CBD but certainly not the most obvious lost I would have seen turned. Imagine, 10 or 15 more lots turned in to mid-rise projects like this. It would at a few thousand more people in and around the CBD and enrich the urban fabric from block to block. 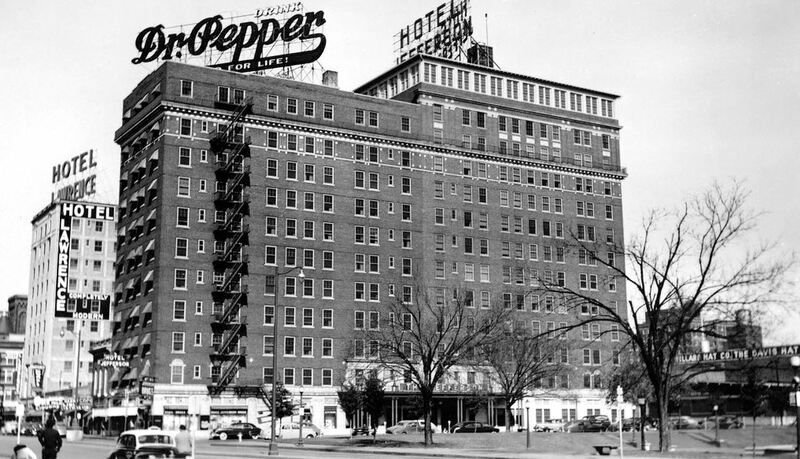 It has a similar presence as the high rise that once stood in this location, the Hotel Jefferson. About the same height and size as well. hjkll wrote: After this will Downtown have enough hotels???? Hopefully. Seems already like way too many to me. More to come somewhere...look at the limited number of hotels in all of Uptown, with so much offfice, residential and entertainment. Might as well build them downtown. 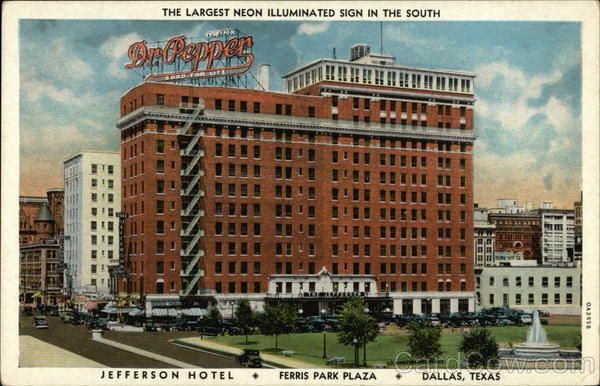 The demand is for hotels in Dallas is incredibly high. Why? Because we are becoming a central business mecca for North American commerce. The fact is, we just might not have enough, yet, to satisfy demand. -DFW Airport is very much in the ~middle of the population center greatly increasing the convenience of a near-airport hotel location. Even with the rise of Collin County, the big airport is still roughly central and convenient for area residents and over-night visitors. There's always a hefty collection of hotels near a big airport, but in DFW the concentration has been advanced by an airport location convenient to business centers, shopping destinations, entertainment/tourist venues and residents. -The recessions of 1980s was wild enough for everyone, but in the Fossil Fuel economy of Texas crashed hard and made everything worse. 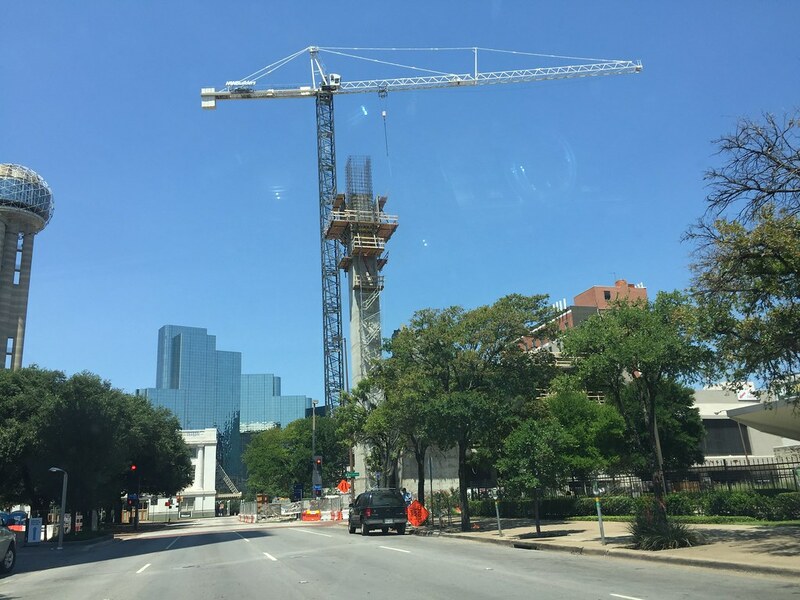 Dallas, specifically the CBD, was double-D devastated thanks to the crony-conoclastic S&L and Real Estate meltdown. I believe most of the white collar criminals never got investigated, few were punished. But the city suffered in deep freeze because of it, sending whatever moxie was left toward the edge of town. 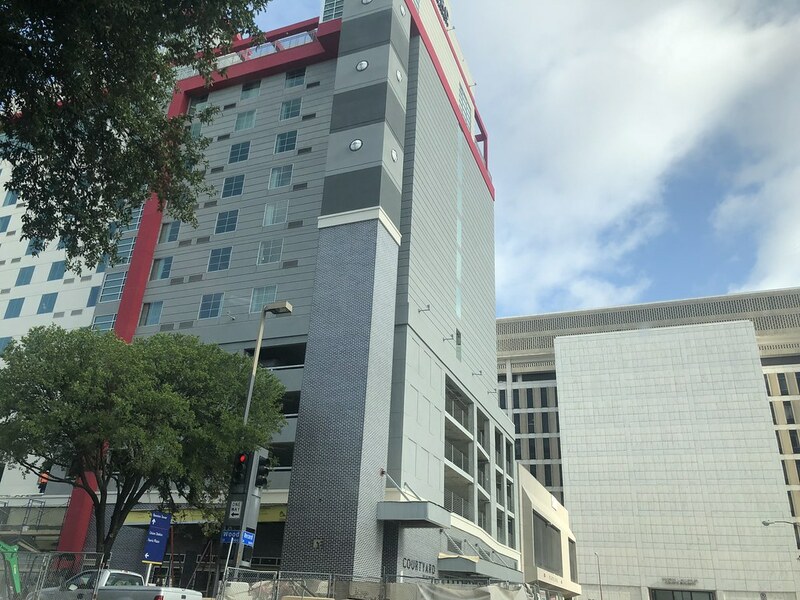 -Despite all of this, the CBD/greater downtown comprised the biggest employment center, but the allure of suburban newness usurped overnight stay desirability. 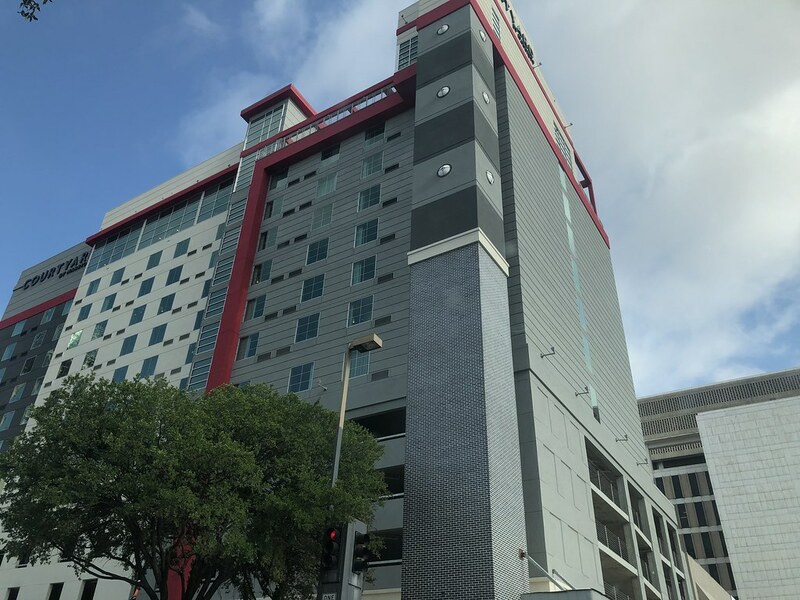 The convention center has always been popular, but for a decade or so the regional dynamics created unhealthy relationship as CBD hotels became overly responsive to Convention Center activities decreasing variety of hotel type. All of this contributed to a downtown hotel room inventory about a quarter of what would be typical. 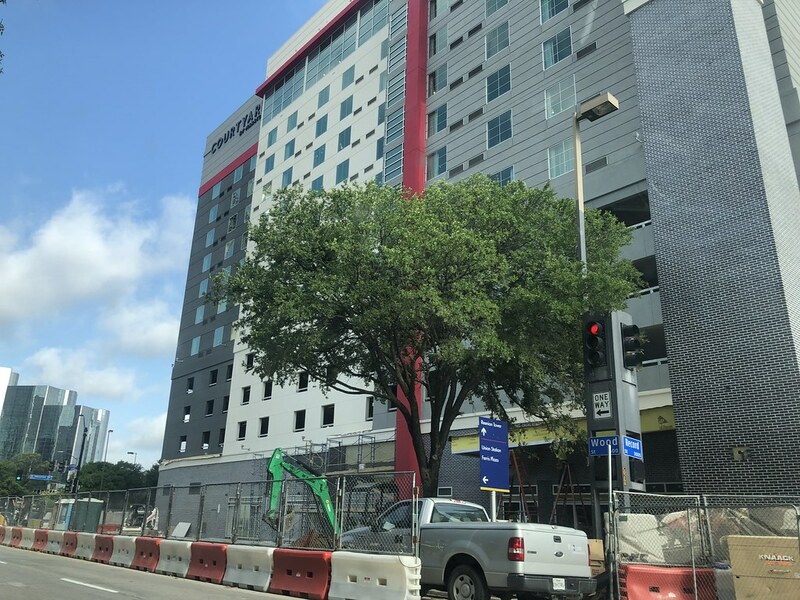 Since 2010, hotel inventory has increased in the downtown area, and the type of rooms available have expanded; the increase hasn't really kept up with the neighborhood, though -- we're just now beginning to see the return of venue variety. Expect to seem many more hotels, and a huge increase in variety and style. I'm not concerned about the amount of hotels opening in the CBD. As stated before, demand is catching up especially in the mid-priced and budget range. Notice how it's mostly Mariott, Hampton Inn, Cambria (Choice Hotels), La Quinta and only one high-end hotel, The Statler. I can see from my office at Renaissance Tower that the construction scaffolding is coming off of this one now. Honestly, it looks worse than I expected. Lazy design. Uninspired color palette. Cheap materials. Complete unawareness of - if not outright contempt for - the nearby public spaces. This thing needs to be out by the airport next to an Olive Garden, not on Houston Street in downtown. But at least it's not a parking lot anymore. I can only see the North and East faces from here but I'll try to walk by sometime soon and get photos. This one when completed will almost certainly outshine the rendering. 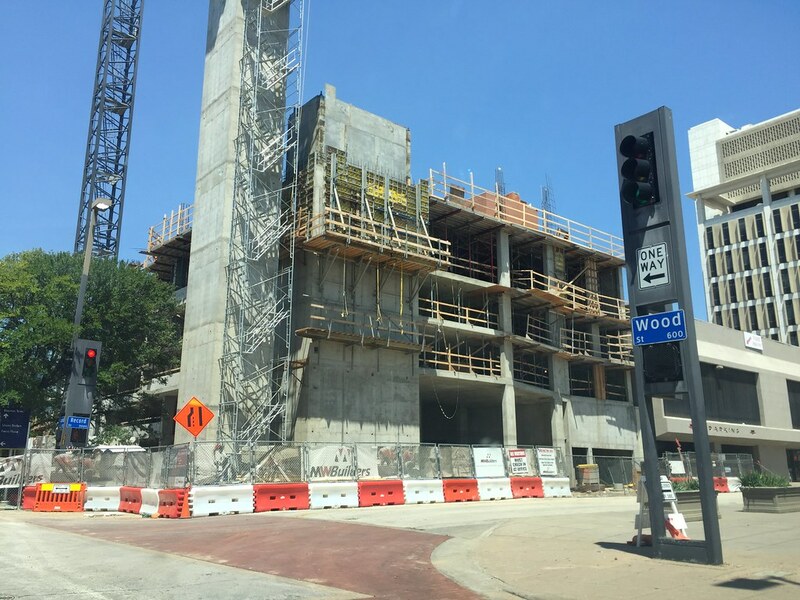 Having the garage access on Houston is what’s wrong with the project. This actually looks better in pictures. I don't get this separated elevator shaft that goes straight to the top floor. Is that an event space, perhaps? There will be a rooftop bar up there. I can kinda see having a separate dedicated elevator for it, especially to keep the boozywoozys from disturbing the wrong hallway, or those who were there who aren't hotel guests who might have had too much fun on the roof... either way, it keeps the main elevator(s) free for regular guests. Also according to some newer renderings, I saw there will be a ground floor cafe with a patio on the main doors corner. Originally I felt like they had almost nothing planned around the ground floor so a cafe will be a much better addition. 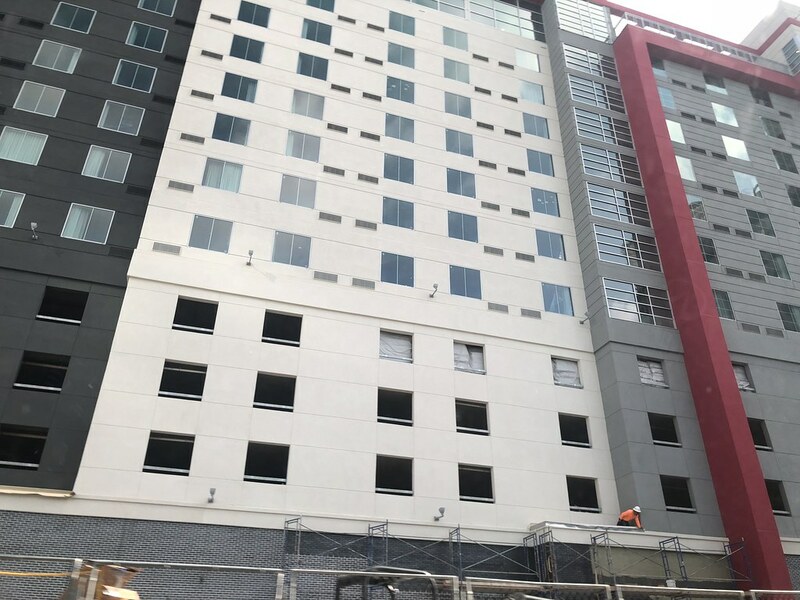 The former small slice parking lot will be a valet/driver-for-hire/drive-thru area for the hotel. Having a rooftop destination makes sense then. It's still strange to see in person. Maybe it will all look better once it's finished. That's good news about the cafe. I didn't know about that. ^Glad they agreed to add a patio facing the park. Thanks for sharing. If they had placed the rooftop bar on the west side, at least it would be a great place to watch the Reunion Tower fireworks every year. Just noticed the signage is up this morning. The brick looks nice, actually the colors seem to work although that red kinda looks like a giant red ribbon. It's just one of the most awkward buildings I have ever seen built. It won't have trouble selling rooms though because of it so we just have to live with it until they repaint it in 10yrs and make it look worse somehow. It does look a little suburban to me, like it would be a great fit here in Las Colinas... But if I'm being honest I don't hate it! It actually turned out much better than I thought it would. I hate the color palette. It looks like a legos project. It actually looks better than I was expecting. I see it every day and think it looks nice. It looks vaguely Scandinavian to me—our Swedish and Norwegian tourists will love it!